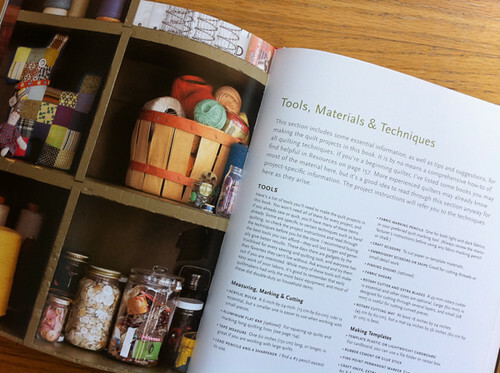 Denyse Schmidt class + PMQG giveaway! 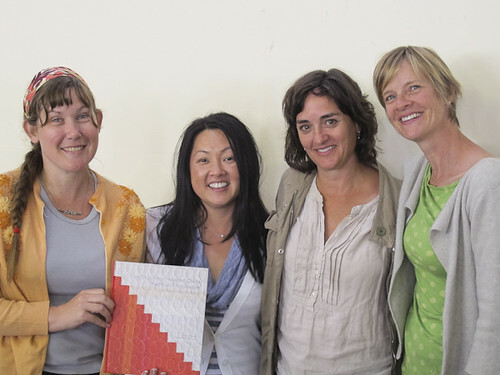 I was so lucky to take one of Denyse Schmidt's modern quilting workshops here at PNCA (for the third time - hi Rachel!) this summer with PMQG friends Paula, Rachel and Amy. Each of her classes is different... the first one pushed us to experiment with random-draw improvisational piecing, the second one was about developing intentional pattern through happy accidents in improv, and this third one, Traditional Improvisation Quilting, invited us to explore making a traditional pattern our own through our creativity and choices in color, design, cutting, piecing, and arrangement. Denyse came to Modern Domestic Friday evening for a lovely book signing and trunk show of four of her quilts from Modern Quilts Traditional Inspiration, which a bunch of us made it over to. 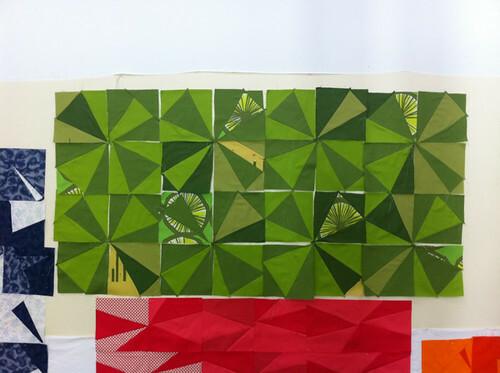 I got quick snapshots of each of her quilts with their pages. 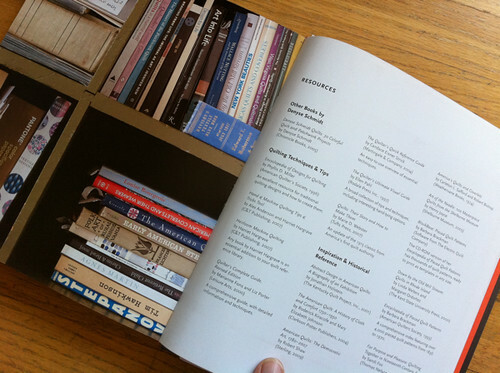 Speaking of her book (more on this later, too)... it is beautiful. 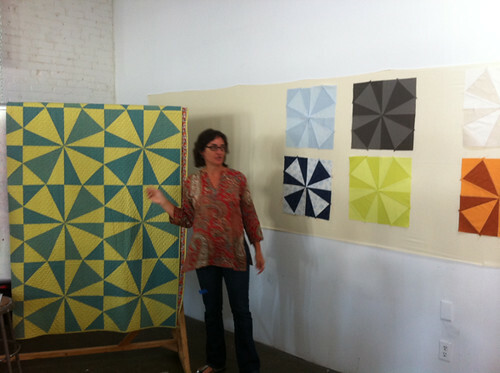 Denyse offers twenty historical quilt designs, each reinterpreted through her lens, and shares their stories. 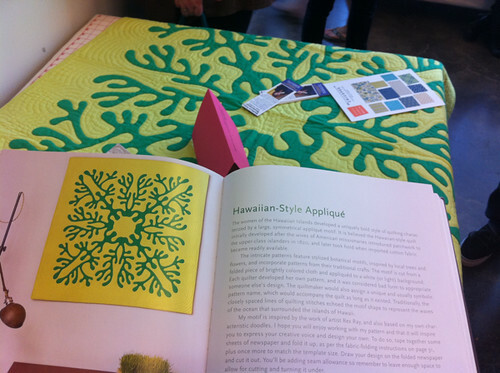 It was very cool to see these four quilts in person! 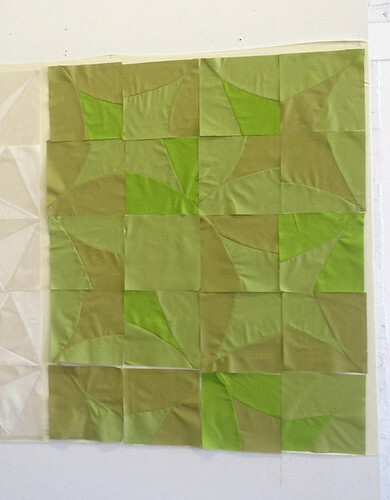 Our class started on Saturday morning with a quick round of template-making and then learning to piece the beautiful windmill shapes of the Shoeman's Puzzle block pattern in our chosen solid fabrics. 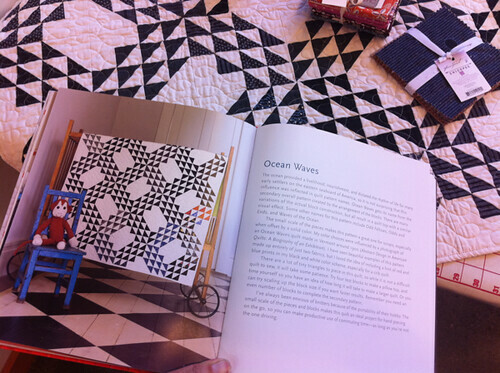 This was my favorite quilt in her book so I was very happy to be working on it! After we made our blocks, we experimented by ditching the templates and cutting the basic angular lines freehand. Once we had four blocks made, up they went on the design wall. It was very cool to see how two fabrics that seemed so similar (a lot of us were worried our picks were too close to provide much contrast) could work together so well in the design. 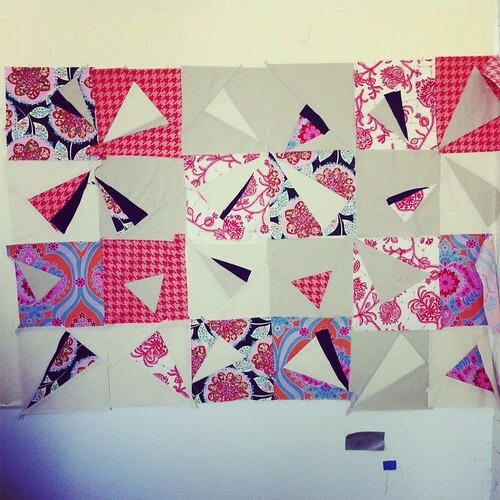 Denyse encouraged us to keep going with sketches and piecing to make the pattern our own. Some people went in totally new directions, which was very cool to watch. 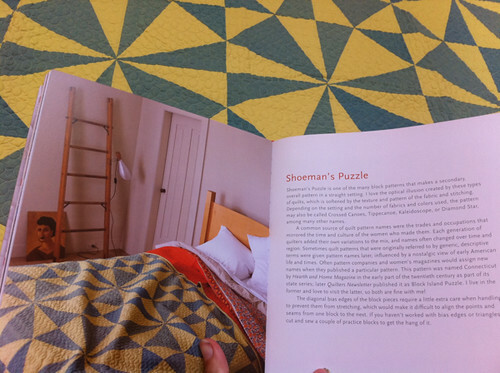 I tried some other improvisational piecing and angles, but ultimately I loved the simplicity of the Shoeman's Puzzle and wanted my "new" design to to stay close to its charm. 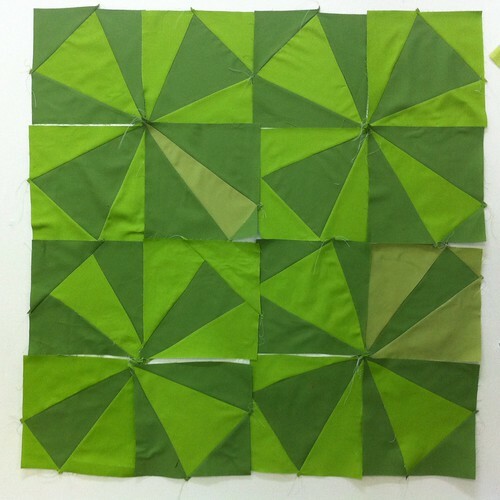 So I kept working with color - trading one of my greens with Rachel was a nice element - and line by cutting freehand, or mixing layers or tones within a block. This is what I had at the end of the first day. For the second day, we continued working in our chosen block style, with guidance from Denyse, and kept adding to the design walls. We took over nearly all of the walls in the Stagecraft building room (where we usually meet, which was cool!) and everywhere you looked was filled with color. We concluded with a review of everyone's designs, going around the room one by one. 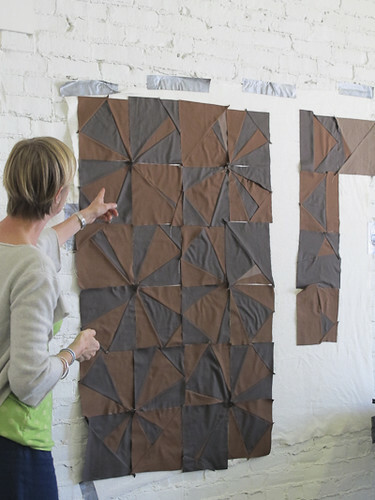 Amy worked with chocolate browns to create her series of blocks for a quilt she wants to finish for her Mt. Hood cabin... backing it with wool. Her description was so evocative and really brought the design to life. Paula mixed her soft, subtle cream solids with bold prints for a stunning balance and combination. During the review, Denyse added some tiny, impactful lines of navy blue and suddenly Paula's work was sharpened to lovely effect. Rachel created a vibrant kites shape she said she's long been drawn to in her work, and continued to build her overall design with curves and angles. I loved how she mixed our two traded greens for a fluid effect. Denyse is a wonderful teacher and her talent for encouraging and inspiring students, while sharing technique really gives her classes depth. The joy of sewing for a whole weekend, finding your own path, and seeing others' work is a gift. 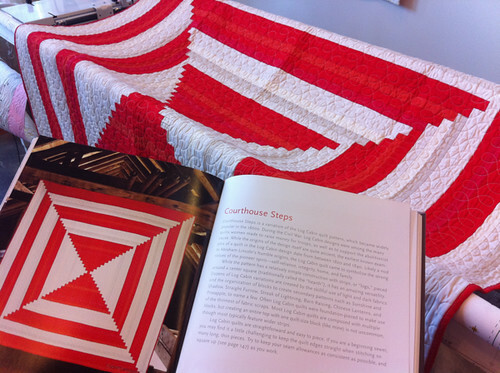 Her book is just as charming - its fresh, beautiful take on the most venerable quilt patterns of the last two centuries is very inspiring! 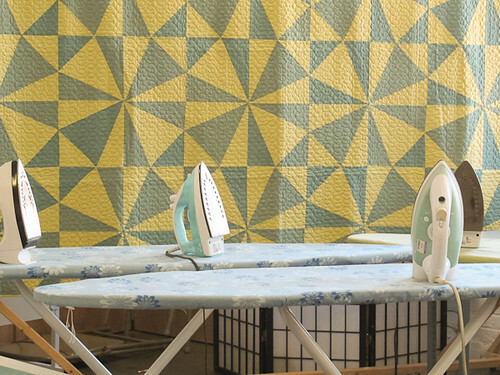 She has generously given a signed copy of Modern Quilts Traditional Inspiration, her new book with STC Craft, to us to give away at the next PMQG meeting - this Thursday evening at PNCA!